More on this recipe later, I’ll quickly fill you in on our adventures in Portugal. We crossed the border about 2 weeks ago and spent out first 2 nights in a campsite by the beach at the mouth of the Minho River. 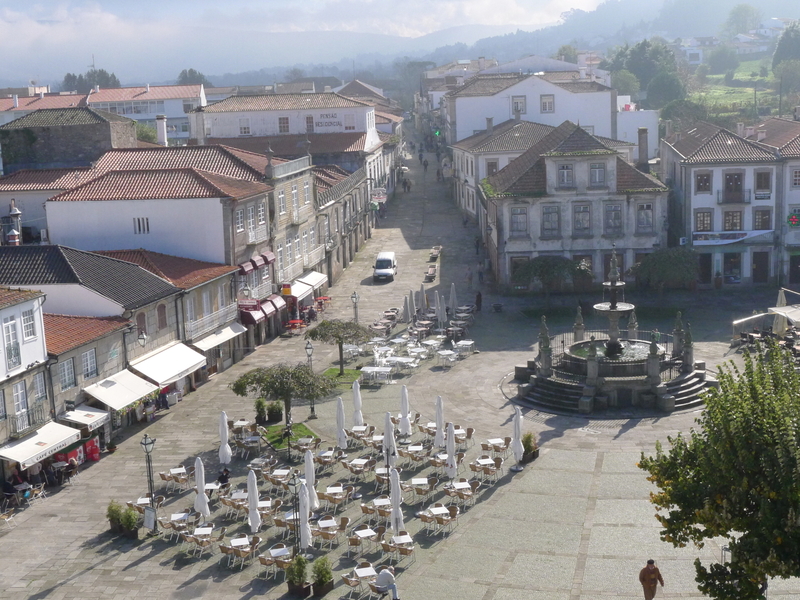 The town of Caminha has views directly across to Spain, and provided us with a wonderful introduction to our latest country. 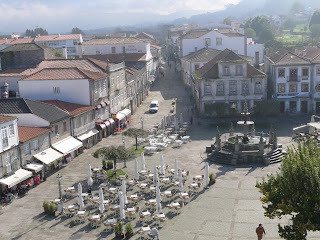 We cycled into town and sent a lovely few hours exploring the old city with the usual collection of churches, walls, towers and a wonderful square that begged us to sit and drink wine in the sun. 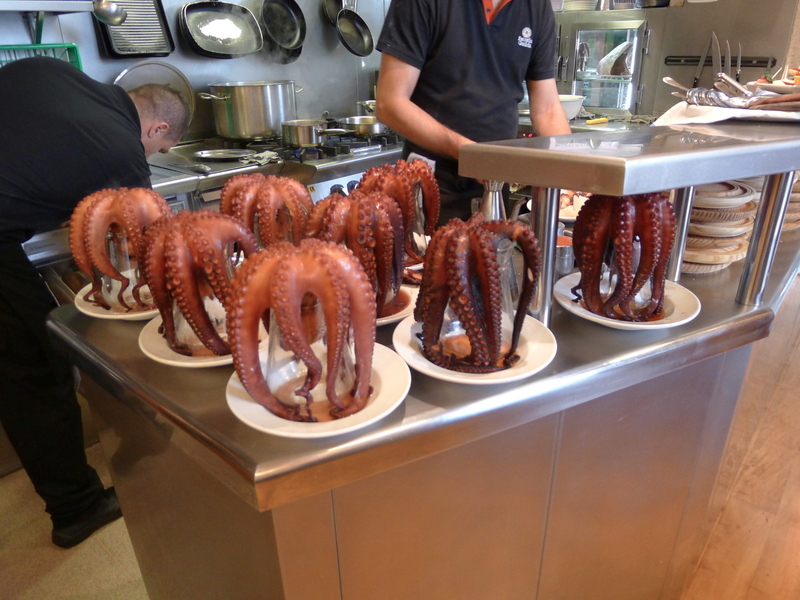 We chatted with some expat locals who pointed us in the direction of the best restaurant in town for lunch. 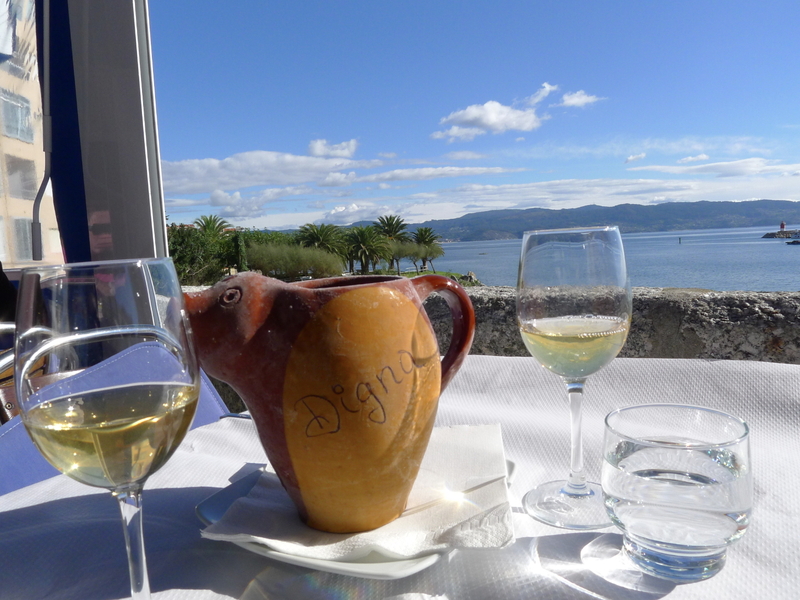 13 euros for 2 three course lunches and a carafe wine and 2 coffees – we instantly fell in love with Portugal. We worked this off with a brilliant walk on the beach. 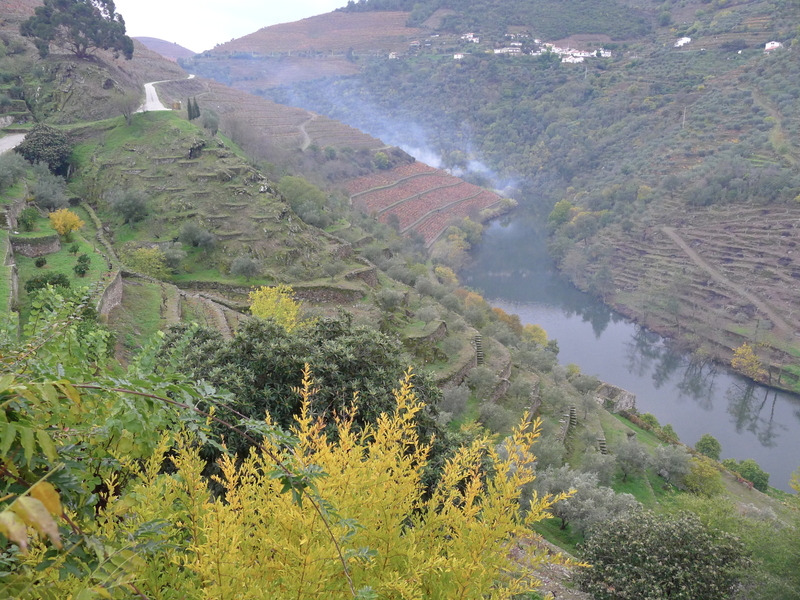 Many of the campsites in Portugal are a closed for the winter, so we drove straight to Oporto and hired a cheapo car (18 euros per day!) in order see the region. Our camp here is close to the beach with about 10kms of brilliant cycle tracks into town. The track has loads of beachside cafes and bars along the way, so you never actually make it into town. We can also take the rollercoaster (aka the local bus) into town – what a ride!! Some of the streets are so narrow that we wonder how the bus makes it around the corners. There is a bit of reversing and jostling on the way. 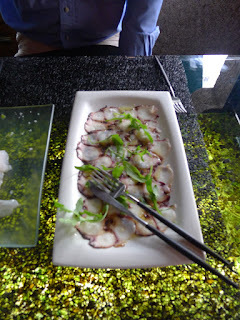 November 13 was Lawrences’ birthday, so you’ll be surprised to hear that we had a lavish lunch. 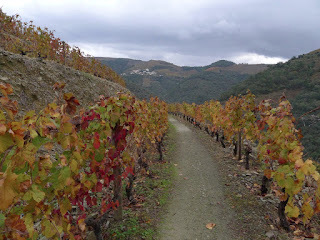 We visited Taylors, one the major Port producers and after doing the obligatory tour of the cellars, booked into the restaurant for a wonderful lunch. 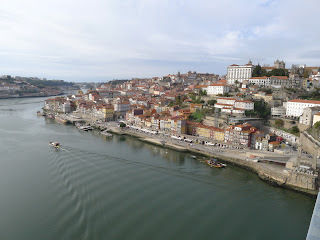 We ate with views across the river to Porto. The town of Oporto (just Porto in Portuguese) is a wonderful to city to wander around - grand buildings, crooked streets, wide avenues, churches galore and a great tower to climb. We took our little Renault Clio out into the Douro Valley for a few days to see the ‘real’ port country. Most of you will know that port is matured in Vila Nova de Gaia (across the river from Porto) but it is grown in the Douro Valley towards the Spanish border. The road along the river was a real adventure and I was carsick for the first time since I can remember, so winding was the road. The views however, made it worth the nausea. 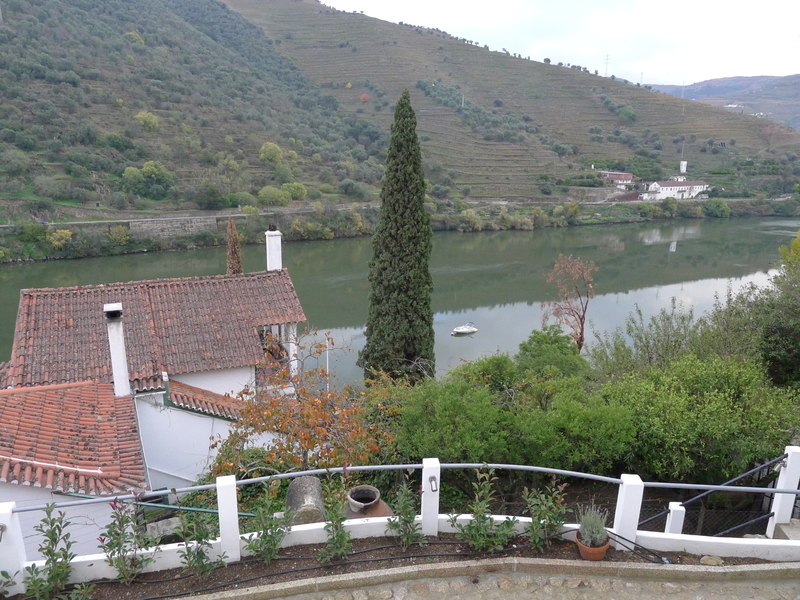 We booked into a ‘Quinta’ for 2 nights – a working vineyard and winery, right on the river, just outside the town of Pinhão, the heart of port country. 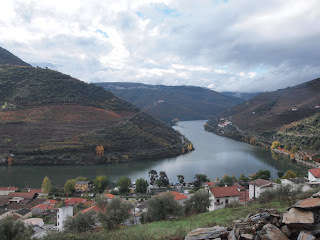 We did a bit of driving in the area, as we were so struck by seeing the wonderful steep terraces along the river where the port grapes area grown. It is just like in the wine books!! We were also able to wander along some of these terraces doing an audio tour supplied by another Quinta. Now to dinner! We ate a local restaurant the first night in Pinhao and enjoyed the hospitality and food so much that we were enticed to come back for a second night for the speciality of the house – Chicken cooked in chicken blood and vinegar, how could we resist?? What a treat, it was absolutely delicious, despite the ingredients. Back in Porto, we drove out to a town called Braga, a long-standing religious capital of Portugal. 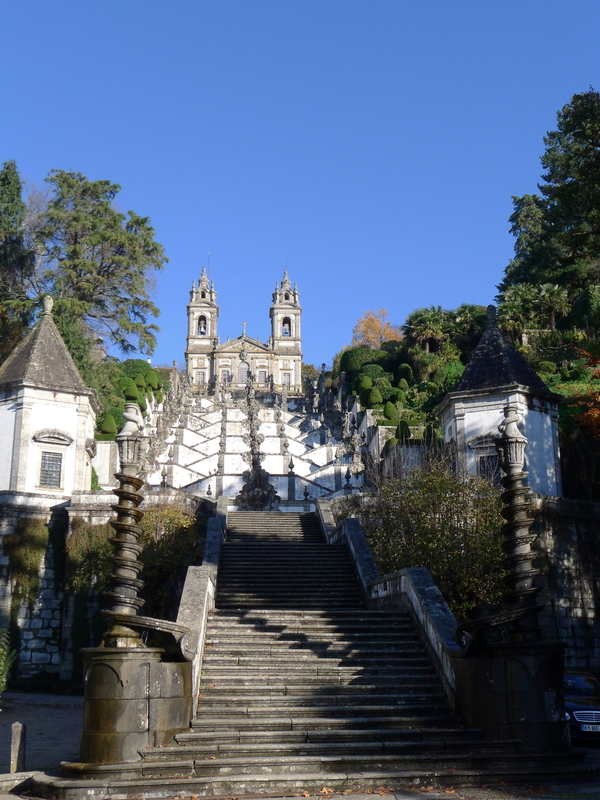 It is positively heaving with churches, but the real show stopper is the Bom Jesus, just out of town. We climbed the 500 plus stairs to the church, eschewing the funicular (that’s for wimps). The real faithful do it on their knees as a demonstration of their devotion. We are really chocking up heaven points with all these church climbs (just in case). Next we’ll head to Lisbon with a side trip to Munich as the first step in our quest for the perfect vehicle to eventually drive back to Australia. Watch this space!!! From the Top of the Cathedral to the End of the World. 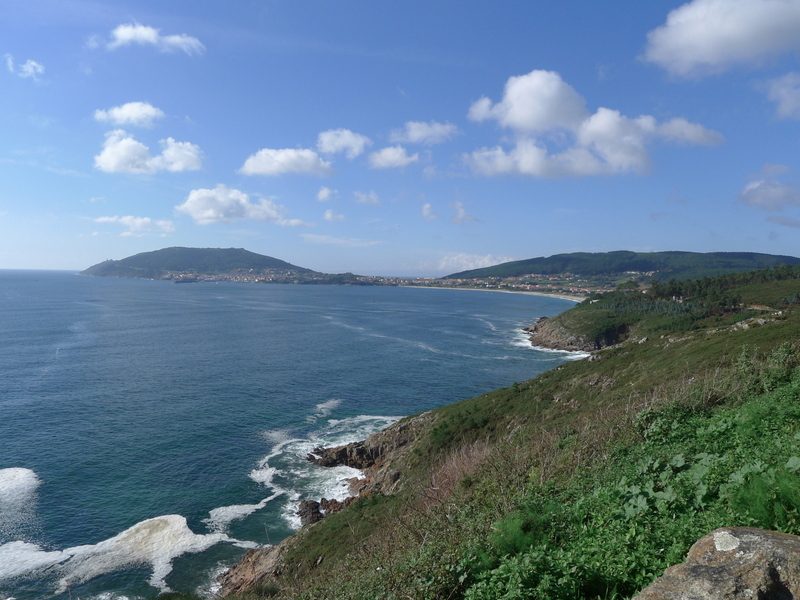 We have now been in the Galicia region for almost 2 weeks. Our first few days were a bit wet, but things have slowly improved and a few lunches in the sun have been possible. Our campsite in Santiago is OK, not glamorous but adequate, and the showers are really hot which is very welcome as the weather continues to get colder. The region is mixed, some parts lovely, some bits not so. Many of the smaller towns, particularly the coastal regions, are quite dreary, bordering on ugly. We think that the failed Spanish architectural students are sent here to practice. 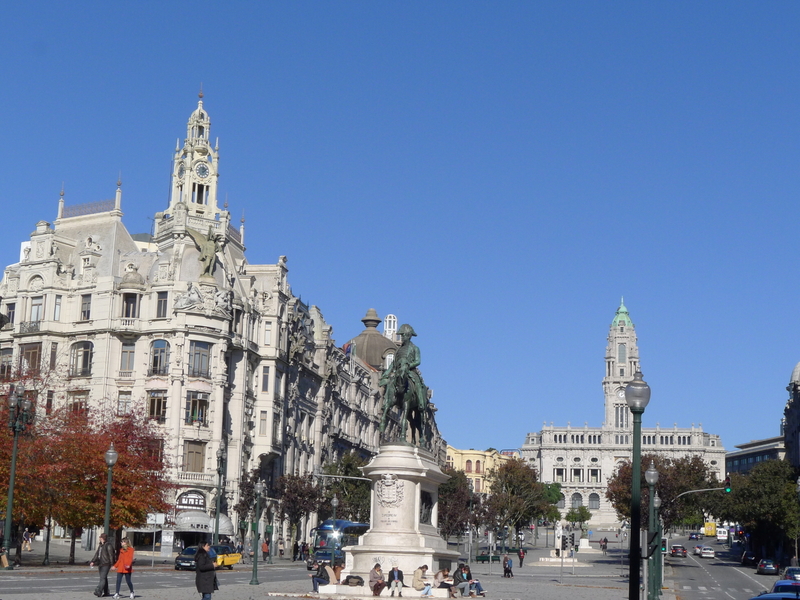 Having said that, Santiago itself has some outstanding buildings, not least of which is the Cathedral, the ultimate goal of all those years of pilgrimage. Santiago (aka the Apostle St James) allegedly arrived here in a stone boat (stone being well known for its buoyancy) and his bones are buried under the now Cathedral. The ‘new’ facade of the cathedral is ‘over the top’ Baroque built in the 17th century by a Canon who didn’t quite like the original 12th century Romanesque front porch (which is quite lovely and can be seen on the tour). 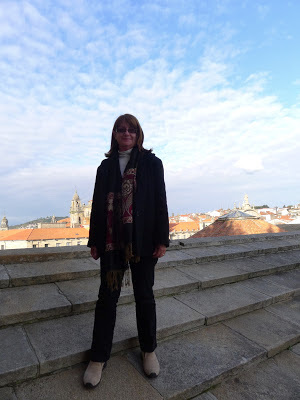 The Roof Top Tour of the cathedral was the highlight of our stay here. We literally walked onto the roof of the cathedral. I, being a sook afraid of heights and having a dodgy ankle, pathetically clung onto Lawrence’s arm the whole time, but was awestruck by this building from on top. The roof is built from granite slabs, stepped to make the roofline. This explains why there are so few windows; solid walls were required to keep the thing up. Standing on the roof of the Cathedral - being brave. 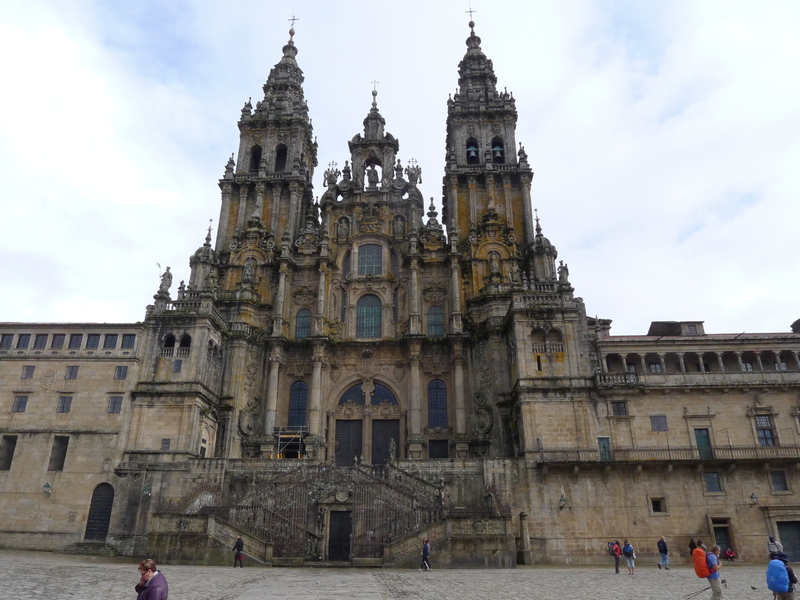 We did the museum as well, so literally saw the cathedral from top to bottom (including the crypt), inside and out. We poked in all corners of the building, saw secret doors, 1st floor cloisters, balconies, the entombed remains of St James and listened to a nun singing the beginning of mass. She should have been on the stage, so lovely was her voice. The altar piece was the typically baroque “I can do more gold carving than you can” style. We went to the end of the earth – Finisterre, actually the most western point of Spain and cruised around a lot of coast. 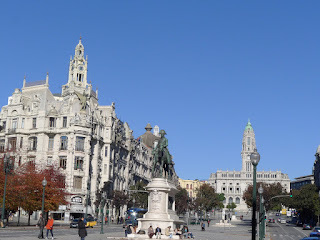 Spent a few hours in A Coruña, a large concrete city famous for being the spiritual home of the fashion chain Zara, but little else to recommend it. 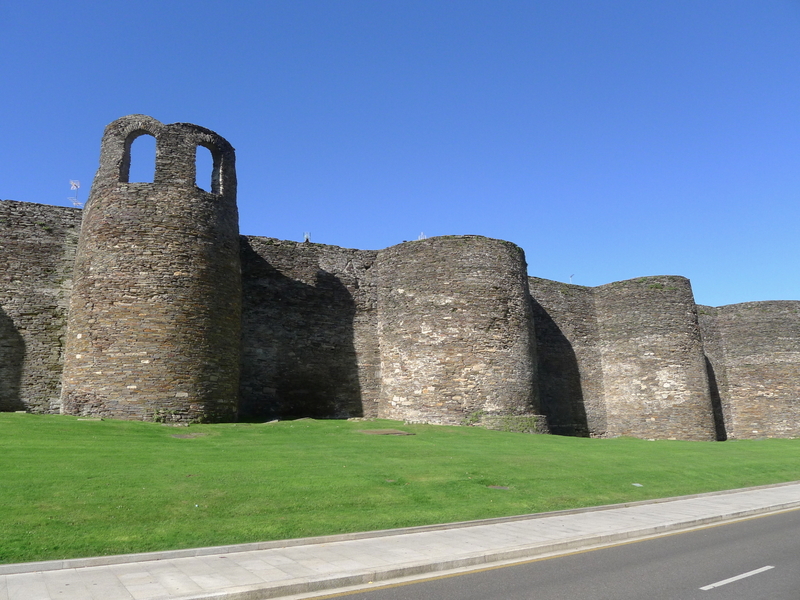 We drove back to Lugo in our little Seat (a car, not a chair), having failed to see inside the Roman walls the first time around. The walls are quite amazing in their completeness, but the city inside is a bit dull with a lot of new building. Still, we did get to do Spanish Lunch in the sun, in a lovely square complete with an orchestra playing show tunes in the bandstand, and an Australian couple sitting next to us, watching the old ladies parading their wonderful coiffures. We visited a wonderful winery on the Rias Baixas region. The region grows mainly Albariño, which has become very fashionable in Spain and the UK, with prices to match. We spent a wonderful 2 hours at Paco & Lola, a new kid on the block winery with wonderful wine and brilliant marketing and merchandising. We met with the export manager and talked about our aim to import Spanish wine to Australia. As a gift, we walked away with 6 bottles of their brilliant wine, definitely a visit to remember. Next stop Portugal (and all those weird grape varieties).